Powerful enough to cover up to 100 Acres! 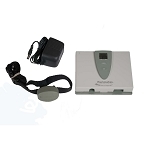 Keeping your dog safe at home is a must for all dog owners. 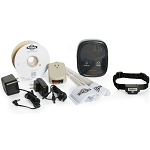 The SportDog Underground Electric Dog Fence can help. Whether your dog hunts, trials or is a full-time companion, this Underground Dog Fence provides freedom and safety for $1,000's less than conventional fencing. Your dog wears a correction collar that receives a signal from the wire and warns him if he ventures too close to the perimeter. The waterproof collar receiver allows for four adjustable levels of correction plus a tone-only and vibrate-only mode. Safe and effective for dogs over 10 pounds. 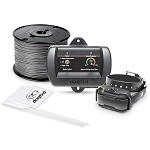 The SportDog Underground Electric Dog Fence is easy to install and versatile enough to accommodate just about any yard or area. Installation is a simple as installing the wire around the perimeter and plugging in the transmitter. Cut Your Pet Fence Installation Time in HALF & Avoid The Task of Burying Wire. Use Our "Pet Fence Staples" to Install Your Underground Fence - Above Ground! Learn About Above Ground Pet Fence Installation. Enclose up to 100 acres! We recommend Heavy Duty Wire in any areas where the wire is installed above ground with our Dog Fence Staples, may experience wear and tear such as rocky conditions or cold weather climates. Learn more. 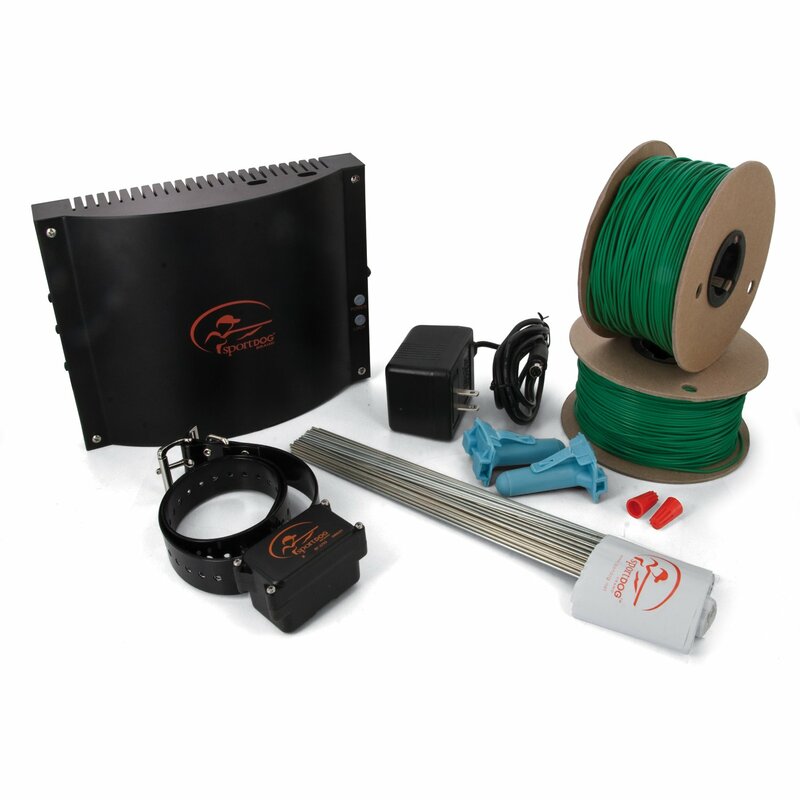 Collar Fits Necks 13" to 25"
This Pet Fence Kit includes everything you need to contain one pet in a yard up to 1 acre. With additional wire and flags and dog fence collars, you can enclose up to 100 acres and contain an unlimited number of pets. 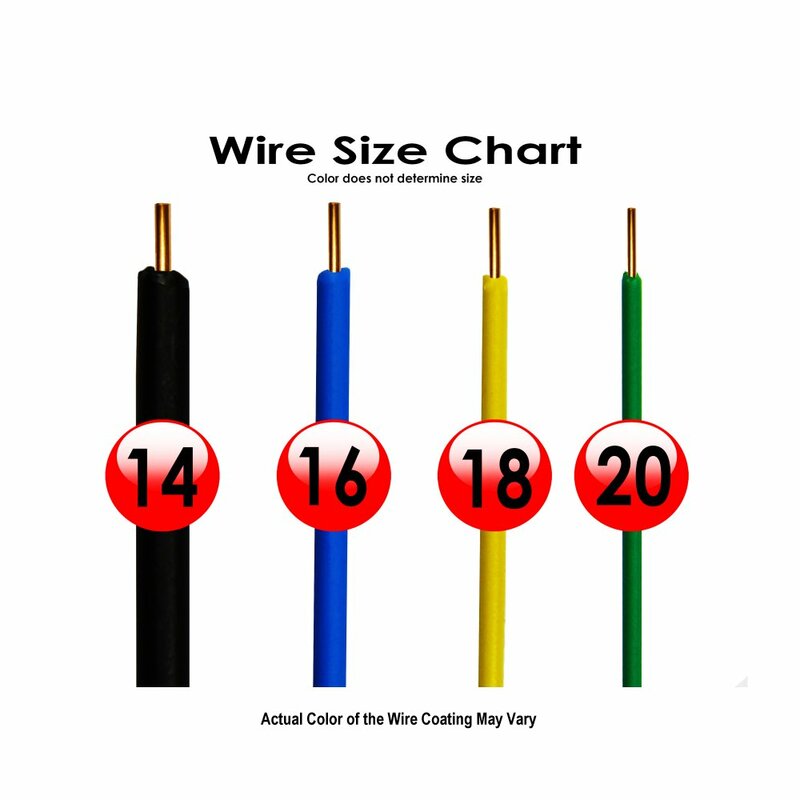 This is the wire included in all self-install kits. 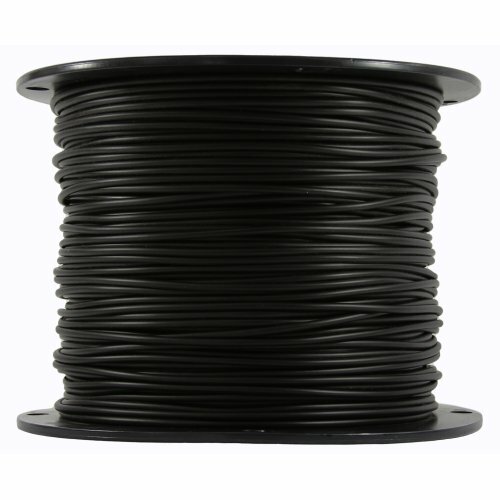 Regardless of gauge, this wire is of medium quality, lighter weight and keeps shipping and initial costs down. This wire will work but does not hold up to the elements as well as a professional grade wire. The vinyl wire coating is prone to cracks and over time exposes the copper leaving the wire susceptible to damage. This can cause issues that impact the functionality of your dog fence system. Since finding, digging up, and repairing wire breaks can be a tedious job at best, many people prefer to upgrade to a pro-grade wire from the start. The initial cost of heavy duty grade wire is a bit more than manufacturer grade wire. However, there are many benefits to choosing heavy duty wire for your dog fence. Heavy Duty grade dog fence wire holds up better to freezing conditions, sunlight exposure, contraction and expansion of the ground, water exposure and general wear and tear. The long term savings in time and replacement if you are planning on staying in your home for at least a year or more, makes the heavier duty wire a much better investment. Maybe just knowing the type of dog make you understand the "problems" you could face. She is a great do, and loves to run and herd anything that moves. I am worried she would run through the fence. She did, and each time we turned it up. Then, she acted like we were beating her and that was not what we wanted, but.... it took about 3 days and now she is great. We have had the fence for about 2 months now and it is working wonderfully. It allows us to leave her outside in the yard when we are away from home. I was having to lock her in a kennel every time we left, so that part we love. She respects the line and is doing great! This product was really easy to install. I enclosed 12 acres for my Chocolate Lab and he no longer wanders the community. It only took about 2 days to train him and he doesn't even go close to the wire. This is a great product and I would recommend anyone to use it. If your trying to decide if Sportdog buried fence is for you, take the plunge!! You won't regret it. We bought this fence for our 2 short haired German Pointers (now 1 year old), and our 4 1/2 year old lab, who has recently started running away, and worrying us, as there are fields with wildlife, and hunters! surrounding our property. It took only one training session for the lab, as he walked into the zone and got shocked! now he has a very healthy aversion to going anywhere near the flags! The pups are still in training, and I think it will take several more sessions, as they are quite headstrong, and will chase anything. Neither has had a 'real' shock yet, only a warning, but the sound, makes them turn away, so I am very hopeful it will work as well for them. It will be great for them to all safely run around the 1 1/2 acre property we have 'fenced' off. Two 15 minute training sessions with our pit bull Blackjack, and he's VERY well trained to the invisible fence. This is for a dog who has never been restrained in a 20 acre area. Now he's quite happy with one acre and we have peace of mind. I have and will continue to recommend your fence to our friends. This dog fence covers so much space! I have to say that this is a really great dog fence. Not only is it effective, but it covers so much space! We have a really big yard, so it was nice that this was able to cover the whole thing plus the front yard! I do not have to worry about my dogs with this. It has paid for itself already just with the peace of mind that comes with it. I am really happy with this fencing. Ernie (rot/lab mix) is 90 lbs and growing. After following the easy to read instructions and burying the wire 3 inches deep (2 acres) and setting up flags the training began. I followed the training literature and Ernie was very responsive. I took the flags down on the 3rd day to mow and never put them back up. Ernie knows his limits and keeps a safe distance from wire boundry. I highly recommend this product for large active dogs. easy as pie to install! the fence took three people about an hour in a half acre area. At first the dogs (2 GSP) had no idea what to do but after a few days of training with hot dogs they understood the boundaries. great product! "I have two Large Golden Retrievers dogs and they are keep in the yard with this unit. 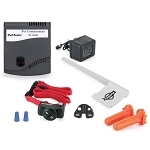 The batteries last about 7 months and to change the all it takes is a 9 volt batteries to replace. And you can set any type of setting to fit you dog. GREAT UNIT"
I bought this product because I needed an affordable and quick alternative to purchasing and installing a real fence to keep in my 2 crazy dogs. It was really easy to install (except digging the trench for the wire). At first I had a hard time with my dogs running through but after adjusting the correction area it worked like a charm. I would recommend double checking that the contact points on the collars are tight every week or so because they can loosen after a while and if they come off you will never find them again (same with the clear protective cap that covers the intensity button) but that said you can easily get replacement parts for a fee. My wife and I installed it around 5 acres. It took about 4 hrs to get a game plan and set up. Once that was done, put collars on and started training. American bulldog set on 3 learned immediatly. The boxer knows its there but cannot grasp the boundry flags yet. But its been only 2 days. Great Product!!! It worked better than i thought it would. Took 30 min to train my 3 year old lab. Very good product different levels of correction depending on how big your dog is. I used a Concrete Saw to cut a trench in the lawn to bury the wire. It went pretty fast doing it that way. My son has a redbone pup. He would be devastated if something happend to this dog. I bought this unit to prevent that. Let me tell you it exceded my expectations of performance. I have owned dogs all my life, I wish I had bought this 30 years ago. We have a 4 year old lab as well who likes to wander once in a while. Not anymore, she learned very quick. Two times she tried to cross and that was it, she hasn't tried again, The pup took a little longer,about two days. No more worries, Sportdog has it under control. Easy setup with the ground staples. We have almost an acre and it was plenty of wire to go around our whole property. Have not had any problems with training, our dog loves to be outside all of the time now and has not had any issues with him running through the fence. Q: I do not have an outdoor electrical outlet. Will I still be able to use this system? The transmitter should be mounted indoors & not outdoors. It needs to be kept above freezing & out of the elements. Q: If I wanted to add more fence later how would I tie the two together?? To expand the containment area of an in-ground dog fence, you would splice in additional wire using waterproof splices. Q: I really like this with 14 gauge wire. What size is the collar? Thanks for the great question! The SportDog fence is For dogs 10 pounds and up and the Waterproof Collar Fits Necks 13" to 25". The Collar strap is 1" wide. Q: How do you order a extra collar for sport dog system ? Q: I have a sportdog field trainer 425s will this collar work with the sdf-100a system as an extra collar ? The Sport Dog training collars are not compatible with any of the In-Ground Fences. 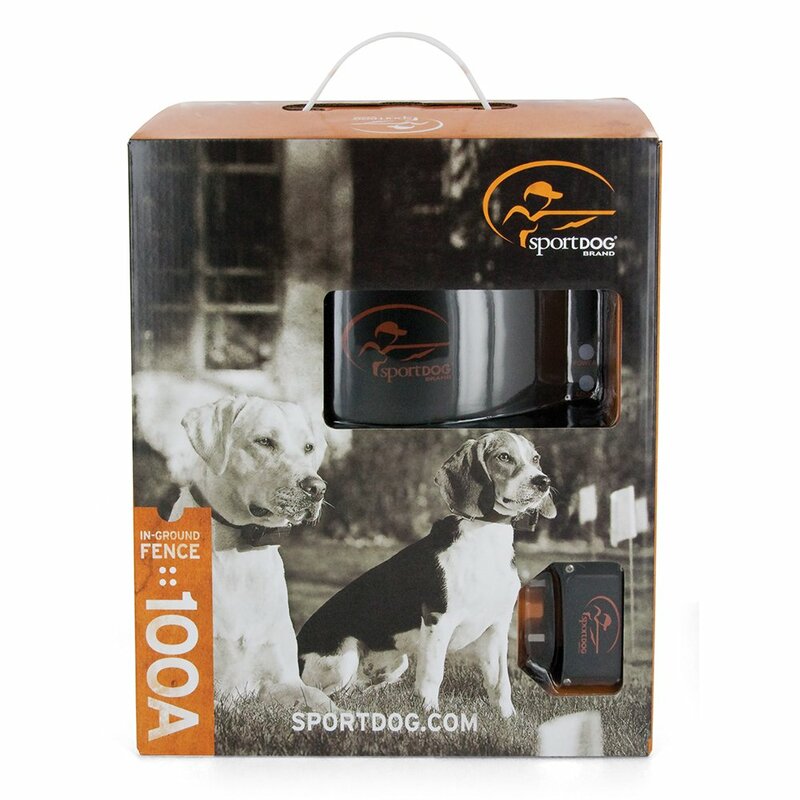 Q: I have SportDog In-Ground Dog Fence SDF-100A and need an additional collar. What should I get? 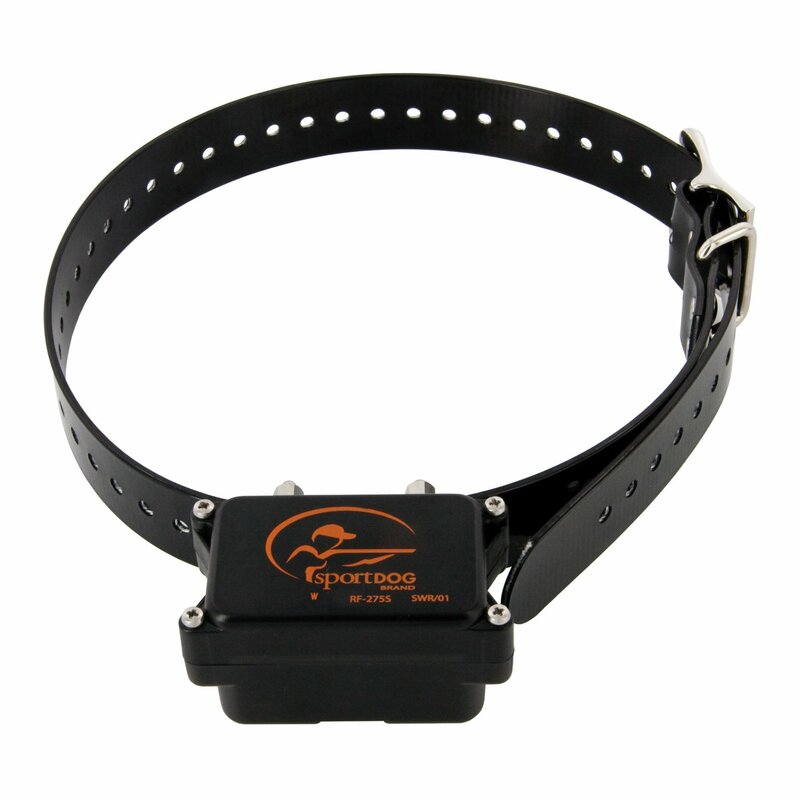 The replacement collar for the Sport Dog system is the Sport Dog Fence Collar (SDF-R). PetSafe and SportDog brands are compatible. However, most other brands are not compatible with each other. Q: How many feet of wire am I going to get with this? 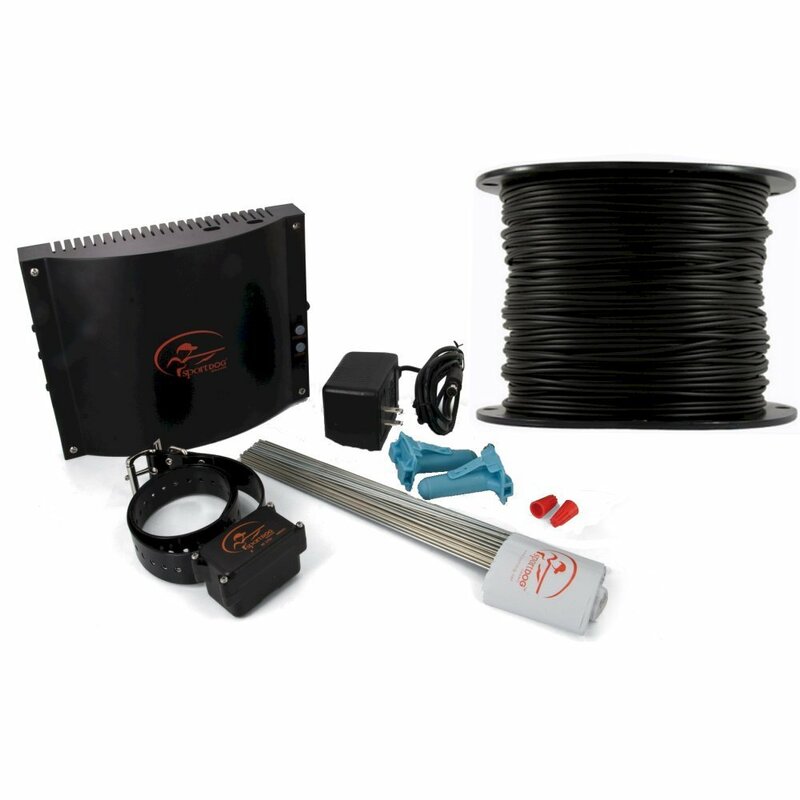 This system comes with 1000 feet of wire. 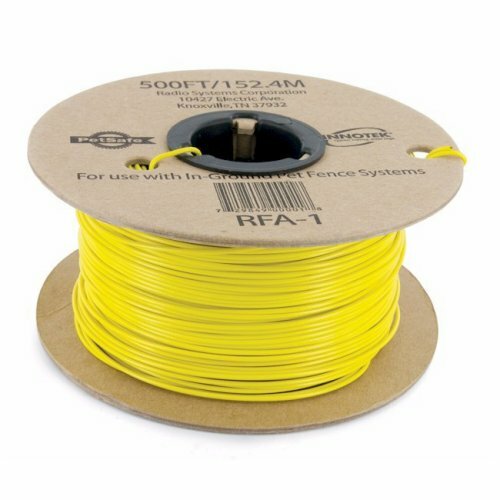 If you choose the factory grade 20 gauge wire it will be (2) 500 ft rolls and if you choose any of the upgraded heavy duty wire it will be one 1000 ft continuous roll. Q: Will this system work on unleveled ground? Our yard is on a slope. We will be doing an area of approximately 1-2 acres with transmitter at the top of slope. Yes, this system will work on uneven ground.